I think a lot of people have been rather disappointed this season. Not with the overall quality of the show but in the lack of screen time for Tyrion, pretty much everyone’s favourite character. And while he didn’t make an appearance in the first half of this episode the second was a stage for Tyrion or more apt, Peter Dinklage to shine. Dinklage has taken a lot of plaudits for his portrayal of Tyrion and rightfully so and that final speech he gave in his defence was probably the best we as an audience have ever seen him. Tyrion looked ready to accept what Jaime was telling him, that he would live out his days on the wall if he just pleaded mercy. It was the perfect scenario for Tywin, not so much Cersei who just wants to see her little brothers head on a spike but Tywin did not forsee the effect that Shae’s lies in court would have on Tyrion. A quick thought on Shae actually, when you saw her giving evidence initially it looked like she was scared and more for the fact that maybe Cersei had threatened her and that was why she was testifying but the more she talked the more it seemed to be coming from a place of hate because of what Tyrion said to her in order for her to leave. Now, if she couldn’t see that he was doing that for her own protection she is just an absolute idiot. So over the net couple of episodes we are going to see who Tyrion chooses as his Champion for his trial by combat and I for one can’t wait to see how it all come across on screen. A quick note for those who haven’t read the books and don’t want to be spoiled, don’t read the title of the 8th Episode, it kind of gives it all away. If Tyrion hadn’t had a great deal of screen time this year then one of my other favourite characters has had even less; Varys. It was great to see Varys back here being his usual self and there was something just fantastic about his brief scene with Prince Oberyn in the Throne Room. With Littlefinger gone Varys hasn’t had anyone really to pit his wits against so it will be interesting to see if they can keep him involved for the rest of the season, i’m sure his little birds in Mereen will have a big part to play. It was good to see Yara Greyjoy and her band of squiddy men attacking the dreadfort in order to try and rescue Theon. it was all over a bit too quick for my liking but it did help to show just how adept the Ironborn are in battle. Saying that, how Ramsay Snow in nothing but a pair of leather bottoms survived that attack I have no idea. If you saw someone wearing no armour would you not try and take him out pretty quickly because he / she would be an easy target? Alas though, the raid was a waste of time for Yara who declared to her own men that her brother was now dead. The scene following that with Ramsay and Reek had me on the edge of my seat. I think we have all had enough of seeing Reek be tortured, last season it was brutal and outstayed it’s welcome and I was muttering to myself throughout that whole scene “just let him have the bath”. 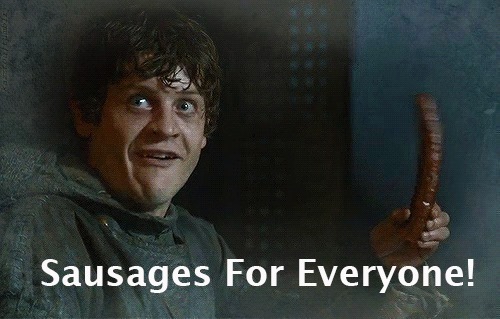 Of course Ramsay wants something from Reek but it was nice to not have to see any more torture. – Not much to say about Dany’s story this week. It was nice to see one of the dragons in full flight doing dragon-y things but still, genuinely don’t care what’s happening in Mereen. Here’s hoping that Varys’ little birds can make something happen. – Also, speaking of Dany. Christ she has a lot of titles. – Long live Ser Davos Seaworth. For me Davos is my favourite character. He is, maybe apart from Sam, the truest character in the show. And let’s not forget, as much of an idiot Stannis is he is actually the true King. – That establishing shot of bravos with the Titan guarding the entrance was simply stunning, some great work there by the CGI team, and nice to see it on the opening credits as well. Ser Davos. A True Angel.